Mr. Wellman was a well-respected, long-time citizen of Kinsley. He was born September 8, 1854 in Steuben County, New York. He moved with his parents to a farm southwest of Kinsley in 1886. When his father’s died in 1891, he and his mother moved into Kinsley where he was elected township trustee, a position he held for many years. He worked caring for the roads. David Lester was active in the G.A.R. (Grand Army of the Republic) and was probably riding in one of those automobiles at the front of the parade. Perhaps the flag was flown or carried by a G.A.R. member or Mr. Wellman. 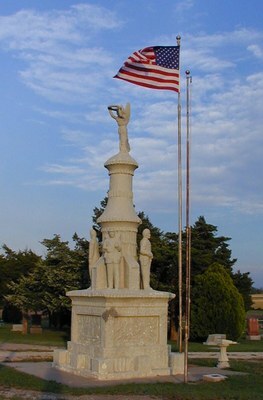 Lester is best-known as the creator of the Civil War Monument in Hillside Cemetery outside of Kinsley. He was 74 years old when he made the monument out of cement in 1917. It is on both the Kansas and National Historic Registries. But back to the story about the flag in the Graphic. 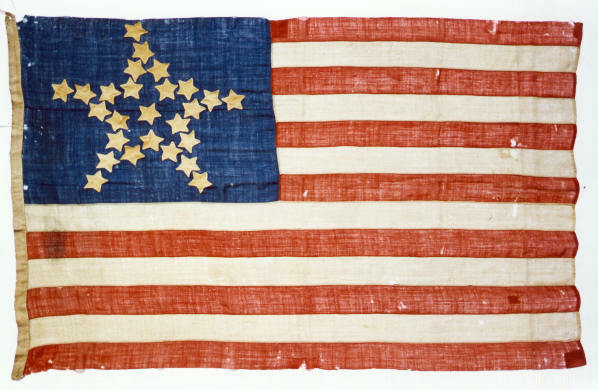 The flag may have looked like this one below, but there is no way of knowing for sure. 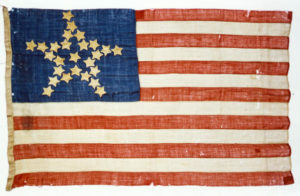 The article goes on to tell the known history of the flag. This entry was posted in Uncategorized on April 5, 2018 by Joan Weaver, Kinsley Library Director.